What Conditions can RLD Help With? 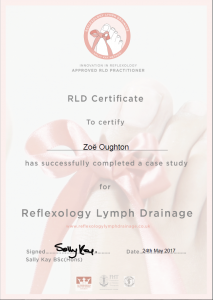 Earlier this year I qualified in Reflexology Lymph Drainage (RLD). It’s a fairly new reflexology technique pioneered by the brilliant Sally Kay. Sally developed the technique primarily to treat patients who have gone through treatment for breast cancer. It’s common for breast cancer patients to develop lymphoedema – a swelling of the arm or leg – after therapy. The swelling is a sign of damage to the lymph vessels or lymph nodes, which leaves the lymphoedema (a build up of fluid). There’s no cure for lymphoedema in traditional medicine so many people live with the condition, unaware that in RLD there is a scientifically proven holistic therapy capable of treating it. Patients can experience such pronounced and painful swelling that movement becomes restricted and their body confidence plummets. The research carried out by Sally and her team proved that patients had a noticeable reduction in swelling immediately after RLD treatment. 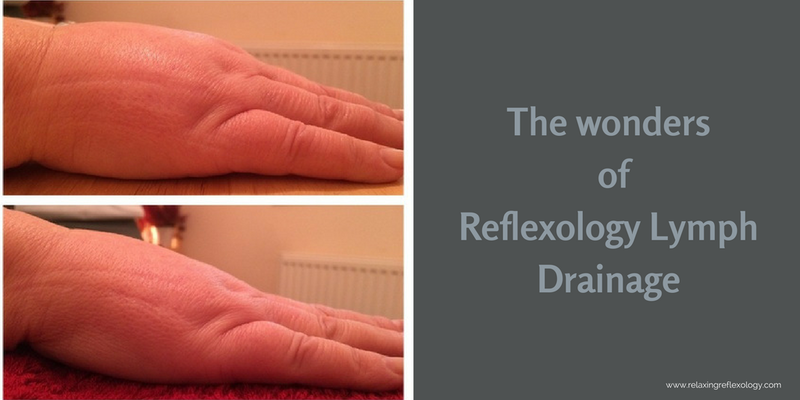 I had heard about the benefits of RLD through chatting to other RLD trained reflexologists. But it wasn’t until one of them offered me a taster session that I experienced it for myself. I jumped at the chance as I’d heard so many good things about it. The reflexology routine is different to a standard reflexology treatment. The unique RLD sequence is carried out three times, starting with the foot on the non-affected side of the body. The therapist uses precise pressure and massage on specific areas of the feet to stimulate the lymph (fluid) and help release it. It’s not painful but patients sometimes feel that some points are more tender than others. When treating patients with lymphoedema, your reflexologist will measure the area of swelling before and after treatment. Most patients experience an immediate reduction in swelling. With regular treatments (once a week for a period of 4-6 weeks is recommended), patients feel less pain and discomfort. They also notice an increase in the strength and mobility of the arm or leg and gain more confidence in their body. RLD is not only for those going through cancer treatment or with the conditions listed above, it’s also used as a therapy to boost the lymph system. People who may feel sluggish, lethargic and find it difficult to get going in a morning can use RLD to help them feel more energised. From my experience, patients feel full of beans the day after their treatment! As a volunteer reflexologist at the Beechwood Cancer Care Centre in Stockport, I’ve been treating patients using standard reflexology for a while. Now, thanks to my RLD qualification, I can offer a treatment that can and does make a difference to their recovery. Whilst using RLD on a lady undergoing breast cancer treatment her doctor noticed that her physical and mental recovery was much quicker than in other patients. I’ve also seen great results using the technique on a lady suffering from lymphoedema in both her legs. The swelling reduced dramatically during the course of her treatment. RLD is a wonderful holistic treatment that brings immediate relief to a whole host of conditions and can also improve general wellbeing and quality of life. To read more about RLD, click here. If you’d like to try this amazing treatment, please give me a call for an initial chat and I’ll be happy to tell you more about it.